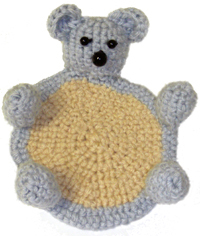 This is a really cute crocheted coaster that is great for kids and adults. Need to get your kids in the habit of using a coaster? Well, they won’t deny putting their cups on this teddy bear. But we all must admit that it’s just so adorable that even us adults can’t resist the teddy bear coaster’s desire to hold your cup. So what are you waiting for? Get crocheting! 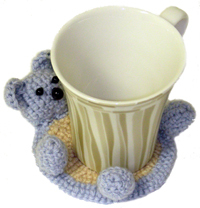 For more animal coaster crochet patterns, check out the Crochet Spot Store. Using photo as a guide, attach eyes and nose to head. Stuff head with fiber fill. Using photo as a guide, assemble parts with yarn needle. Do you need help with the crochet pattern? No Worries, just leave a comment and I will help you! This entry was posted on Tuesday, February 10th, 2009 at 10:15 PM by Rachel Choi	and is filed under Best Crochet Patterns, Free Crochet Patterns. You can follow any responses to this entry through the RSS 2.0 feed. You can leave a response, or trackback from your own site. That is such a cute coaster! It’s wonderful that you made it available for free to all of us crocheters. I stumbled and review your blog post with StumbleUpon so others can take advantage of this adorable free pattern. Thanks Cindy for the taking the time to stumble it! I really appreciate it. I’m glad you like it Tanya, let me know how it goes! Thanks for leaving your comment Vicki, it means a lot to me. I love sharing my patterns and I’m so glad that it motivates you to share yours! I hope your coaster set comes out great! Your patterns are GREAT! For someone so young to be such a great designer . . . I raise my hook to you! keep designing, and thanks for being so awesome as to share them for FREE! Wow Amy! No one has ever raised their hook to me before 🙂 It’s because of such nice people like you that I enjoy sharing my patterns so much! This is so CUTE!! My kids saw it and are now begging me to make one for each of then. So I’m going to go see if I have some yarn that will work. Thank you so much for sharing this!!!! You did a great job!! That’s good to hear Melissa! I hope your kids enjoy them!!! I think these coasters are precious. I will be making a set for my sister. I know her children will enjoy them! I just subscribed after finding you for the first time today. Thank you for sharing your love of crochet with others. Your website is so informative and inspirational. Have a great weekend! I’m so glad that you decided to make a set of these coasters! Let me know if you need any help with them. Also thanks for subscribing! I just love your site,, You have such nice things on here..I really like the things you have on here.. I would like to try and make some of your patterns ,Instead of the same old things I make..
Keep up the good work and keep smiling.. And thanks for sharing your patterns..
Oh my God! That is the most beautiful Coaster I have ever seen! I am definitely going to make one for my coffee mug. Thanks for sharing those beautiful free patterns. Keep the good work. I really enjoy, like you say “FUNTASTIC “patterns. I think this is a great pattern to super- size and make a blanket out of. hi rachel! can i have a suggestion to have a crochet pattern for realy real begginers. (just like me!) I’m kinda 11 years old 🙂 maybe something a little bit more easy than your other grate patterns. thanks !!!!!!!!!!!! do you crochet for those of us that dont? or where can I find someone to do this for me? one to buy. Can you help me find one? Hey Rebecca! Try looking on etsy. I’ve seen a bunch on there that you can buy. I used a larger hook and two strands of yarn throughout and made your teddy bear coaster into a PJ bag for my granddaughter by making two bodies. I crocheted them together, leaving a space for a zipper that I sewed in by hand. It turned out really cute! Awww how cute are those, Great job!!! Keep up good work! I’ve finished the pencil case pattern, I now continue with this teddy bear coaster, I’m planing to give this to a boy as his birthday is coming soon.. I’m so happy and excited to learn your pattern here! I finished making the four limbs, ears and body, I have some problems doing the head, as I dont know when to stuff in the fiberfill and how to decrease after that. I’ve no problem doing the limbs and stuff in fiberfill and also making the decrease instructions stated.. And also instructions on how to sew all these parts to the base coaster.Please guide me, thank you! You stuff the head after you finish it. There will be an opening at the bottom of the head when you are done. Don’t worry about decreasing it closed. Instead, sew it closed when you are sewing it to the body. You can whip stitch the head and limbs to the end of the body as positioned in the picture. Thank you Rachel, I’m going to do it right now.. haha.. Bye! I finished the pattern followed all your instructions, and I added a tiny scarf attached around the teddy’s neck and it looked so great!! Thank you Rachel..Next I’m going to make the fish in ocean bookmark, your clear tutorial and prompt reply really motivates me! Cheers! Great! Glad I can help! I’m just about to try this adorable project, thank you! One quick question: could I start with a magic circle instead of ch2, 8sc? I’m new to magic circles but when I do ‘non-magic’ ones I always have a big hole in the center. Hi Mia, yes you can use a magic circle to replace the ch 2. Sorry to ask another question but for the head when you say: “Round 9: (decrease, sc in next sc) around” do you mean ‘do a decrease and then single crochet in the next stitch”? I’m still new to crochet so I’ve never done decreasing before and I want to try and get it right! I love this pattern! I’m gonna try to make a rug-sized version for my sister-in-law; hope it turns out as adorable as your coasters! What an adorable coaster! A question though: The head ends with: “Round 9: (decrease, sc in next sc) around,” leaving an opening in the head. Are we supposed to close that? Did I miss part of the instructions or am I misunderstanding something? Hello! You can whip stitch the opening closed when you sew it to the coaster. Let me know if you need more help with it!